Nairon teaches Algebra at Westlake Academy and has been teaching math in the DFW area for 20 years. 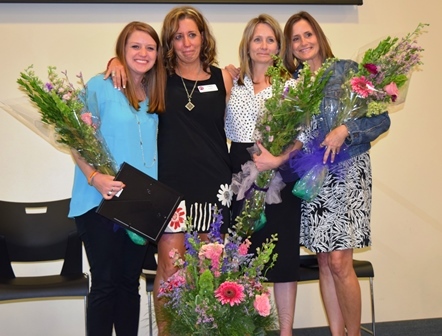 The other finalists included three teachers from the Primary Years Programme: Sarah Firsching, first grade teacher; Nicole Bauer, primary mathematics specialist and department head; and Laura Fischer, fourth grade teacher. Westlake Academy has honored a Teacher of the Year since 2013. A selection committee coordinated by the Campus Leadership Team (CLT) selects the winner. The CLT is made up of students, teachers, administration, and community members from Westlake and Keller. After submissions to the team from parents, students, teachers and staff, the list was narrowed to the four nominees. The selection committee, comprised of prominent academic, IB, corporate, and community leaders from around the country, scored the finalists using more than 30 characteristics constituting the Academy's Teacher of the Year rubric. The selection committee makes their decision based on several criteria including teaching 21st century skills, using new competencies graduates need, instilling International Baccalaureate (IB) values, classroom atmosphere, the culture of how a teacher insures students to be good learners, and knowledge the teacher has in their respective area of expertise. Len Avecilla, CLT Chair, said Nairon achieved near-perfect scores in all five areas of performance. “A few of the particularly notable high scores referenced exceptional attention to establishing a physical setting (learning environment) conducive to student engagement, excellence in leveraging all teaching and learning resources available to her, a high degree of commitment (to students, parents, and colleagues), and her intensity regarding her personal learning (professional development),” Avecilla said. Nairon received a beautiful crystal award and certificate to remember this honor, along with a $1,500 cash award to use for personal or professional development from the academy’s parent-teacher organization, the WA House of Commons. ⇐Previous Westlake Academy Ranked as the No.1 High School in Fort WorthNext⇒ Congratulations to Westlake Academy Class of 2016!